INNOVAVENT – Laser-Optics-Systems for crystallization, annealing and doping applications of semiconductors are of modular design and are developed in close cooperation with users and system integrators. The products range from low budget optical systems to create a line focus up to complex laser optical subsystems including laser, homogenizing optics, imaging p-lens and beam diagnostics. UV-SLA (Solid State Laser Annealing) regular grain structure. VOLCANO® Laser Optics includes cylindrical focusing and imaging of Gaussian beams. 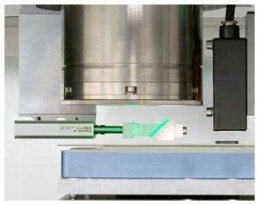 Long lines up to 250 mm, as sharp as FWHM 20-50 µm in the scan axis. 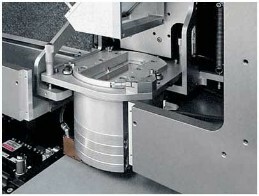 The cylindrical imaging is done by the INNOVAVENT FALCON® p-lens family. The VOLCANO® Laser Optics is operated with lasers emitting 515 nm, 532nm and UV 343nm and 355nm. 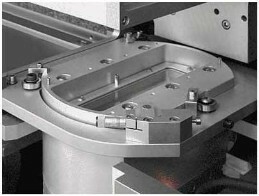 The VOLCANO® LINE BEAM Laser Optics create a Gaussian line beam of 20-50µm FWHM width and 300-750mm length, up to 1000mm. 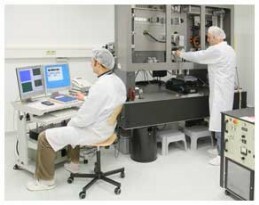 High power green (532nm) DPSSL light is provided by fibers to the line beam optics module G-version. This method allows multiplexing of laser light sources and obtaining an energy density of >=500m J/cm² in a 750mm long line. The energy density in this line geometry converts 50-70nm a-Si films into p-Si for the manufacturing of LCD-TFT back plates. Free space homogenizer optics based beam coupling is applied with 343nm UV lasers. The VOLCANO UV Laser optics is operated with a pulsed TruMicro 7370 UV laser. The pulsed UV laser light is well suited to lift off plastic films from glass plates such as used in flexible OLED displays. Further the 15ns, 343nm wavelength allows to prepare ELA like uniform p-Si film conversion from a-Si films for high resolution OLED TFT back plate displays. The product group LAVA® Laser Optics employs a spherical imaging p-lens. The CaF2 high performance p-lens EAGLE® plus provides thermal-lens-free diffraction limited 2-dimensional imaging of lines within a field of view of 10 mm. This p-Lens is available for 515nm/532nm and 1064nm (IR) and it can be operated with pulsed and cw lasers.